On this introduction to lovely Bergen you will board a motor coach to sightsee through downtown Bergen with its old wooden Hanseatic pier, Bryggen, the medieval King Håkon’s Hall, erected during the reign of King Håkon Håkonsson, the Rosenkrantz Tower, St. Mary’s Church, built around 1170, and one of the finest examples of Romanesque architecture in Norway, the peninsula Nordnes, Bergen Theater (Den National Scene), and Grieghallen, the modern concert hall named after Norway’s great composer, Edvard Grieg. Your tour will continue over to Kalfaret, the noble residential area of Bergen, and on to the main attraction of the day - Ulriken Mountain. You will be taken by cable car to the highest of Bergen’s famous "Seven Mountains," Ulriken, to spectacular scenery and mountain terrain 2,100 feet above the city streets. From the summit, at the Sky:skraperen you will be introduced to one of the local specialties while you enjoy magnificent views of Bergen and the surrounding area - the sea, the islands, fjords, and mountains, before returning back to the lower station to board your motor coach for a short trip back to the pier. Please note: People can stay on the motor coach if walking becomes too strenuous during the tour. There is a ramp and lift at the Ulriken cable car. Your guide will give you a brief overview on how to operate the Segway before you begin your ride through Bergenhus Fortress and its beautiful park. Continuing on to historical Bryggen (UNESCO World Heritage Site) you will pass the fish market. Your adventure will also take you by Bergen Aquarium and into Nordnes Park, one of Bergen’s most beautiful parks on the farthest end of the town. Driving along the classic alleyways of Bergen you will head toward the National Norwegian Theater, the Blue Stone, John’s Church and Lille Lungegårdsvannet. At Fjellveien you will have a wonderful view over the center of Bergen and the surrounding areas before you head back down to the city center to Bergenhus Park. Please note: Timings are approximate and subject to modifications. This excursion is not recommended for guests with physical/walking disabilities. It is recommended that guests dress in warm layered clothing and wear flat comfortable shoes. This enriching excursion will take you south of Bergen to view a remarkable wooden church and to visit the home of Norway's famed composer, Edvard Grieg. You will drive through the residential areas south of Bergen, towards Fana and the Stave Church. The old Stave Church at Fantoft was originally built in Fortun in Sogn in 1150, and was moved to Fantoft in 1883 to save it from demolition and preserve it as part of the nation’s heritage. After a destructive 1992 fire, artisans extensively and faithfully restored the church to its former beauty. Inside, you can admire the traditional timber construction and elaborately carved decoration. From spiritual faith to musical brilliance, you'll also visit Troldhaugen, home of Norway's famed composer Edvard Grieg. Troldhaugen was built in 1885 and Edvard Grieg lived there for 22 years together with his wife Nina. Grieg composed many of his best-known works in the composer’s hut by the shore of Lake Nordås. Enjoy a guided tour of the Villa, museum and the garden and some free time to walk around on your own afterwards. Your visit will end with the highlight of the tour; a private recital in Troldsalen. One of the best interpreters of Grieg’s music will play some of the famous pieces as well as some of the more unknown ones, and tell stories and anecdotes about the composer and his wife. Please note: It is recommended that you dress in layered clothing and wear flat comfortable walking shoes. This tour involves stone steps, uneven ground and gradual slopes. You will begin your walk past Bryggen (UNESCO World Heritage Site) where your guide will tell you about the legendary Hanseatic site. You will see the famous Fish Market and continue to the most popular attraction in Bergen, the funicular, that ascends to Mount Fløyen. From its 1,050-foot-height, you will admire the beautiful landscape of the city and the fjords from above, one of the most spectacular views in Norway. At the top of Mount Fløyen you will begin your hike across the mountain to Ovre Eide Farm. You will discover the unique nature of Norway, passing lakes, wild rivers and breathtaking views. At the top of Mount Sandviken you will make a brief stop to enjoy some chocolate. Afterward, you will descend into the valley of the old mail route between Trondheim and Bergen to reach our final destination, Øvre-Eide Farm. Øvre-Eide Farm is located in the idyllic surroundings of Lake Jordal. The owner of the farm is also a confectioner and he will lovingly prepare some typical Norwegian specialties for you. Enjoy the pleasure of listening to exciting stories about the traditional farm life in the countryside of Norway while enjoying a traditional meal! Please note: It is recommended that you dress in layered clothing and wear flat comfortable walking/hiking shoes. This hike covers about 5 miles of easy walking and involves some steps, uneven ground, cobble stones, and gradual slopes. Begin your tour with a walk to the UNESCO World Heritage Site - Bryggen. Here you will wander through the narrow streets between the houses dating back to 18th century. Your guide will take you on a journey back in time, where you will learn more about the fascinating development of the old Hanseatic city. Stop and admire St. Mary’s Church dating back to 1170 and one of the finest examples of Romanesque architecture in Norway. Continue your walk to Mount Floyen Funicular station, Bergen’s most famous mountain. At the top of the mountain you can enjoy some free time with a spectacular view of Bergen. On your way back to the ship you will learn more about Bergen in the 20th century and you will make a stop at Fisketorget, the fish market, located at the very heart of Bergen. Please note: It is recommended that guests dress in warm, layered clothing and wear flat comfortable walking shoes. This walking tour involves steps, uneven ground, cobble stone paths, gradual slopes, and is therefore not suitable for guests with any walking difficulties. This tour will show you Geiranger and the spectacular Geirangerfjord from the most famous viewpoints in the area. You will board your motor coach departing from the pier. From the landing stage in Geiranger the drive goes uphill via the Ørnesvingen (Eagle’s Road) to a viewpoint, where you will see a breathtaking view of the fjord and your ship. After a photo stop, you will return to Geiranger and continue through the wild Flydal Valley along numerous hairpin bends to Lake Djupvatn. Afterwards you will continue along the fascinating road to the summit of Mount Dalsnibba (5,000 ft. elev.). From here you will be able to see far beyond the Geirangerfjord on a clear day. On the way back to Geiranger and to your waiting yacht, there will be a photo stop at Flydalsjuvet viewpoint. Please note: There are steps to access the motor coach, no wheelchair elevator and wheelchairs must be collapsible. The ride along Eagle’s Road contains several hairpin turns. Join this e-bike adventure taking you past scenic landscape, waterfalls, farms and up to stunning views of Geiranger. This is cycling made easy to give you the extra push to enjoy one of Geiranger’s most breathtaking overlooks, Flydalsjuvet! After receiving instruction on how to operate your electric bike you will begin your journey to the famous viewpoint, Flydalsjuvet, offering an impressive view of Geiranger, Geirangerfjord and your cruise ship. You will also have a photo opportunity at the Queen's Chair before making your way to Knuten - The Knot. This unique and scenic road was designed to reduce the incline and crosses itself by a stone bridge. It was taken out of use in the 1970’s and represents an important monument to the road-building pioneers who built Geiranger Road in 1881. Bicycling on to Dalen Farm you will be served coffee/tea and waffles while you learn about the life in Dalen through storytelling. Here you can refill drinking bottles and use the service rooms. Cruising back to Geiranger you will pass the Grindalselva waterfall - the drinking resource to Geiranger. Please note: Participants must be at least 15 years of age and children must be accompanied by an adult. It is recommended you wear sneakers, dress in layers, bring a windbreaker jacket or a rain coat. It can be cold biking downhill. Bring a bottle of water and a backpack for your belongings. You need to know how to ride a bike and be physically fit to participate. Experience the magnificent Geirangerfjord in a safe and comfortable open RIB (rigid inflatable boat). You will be met at your yacht to walk to the RIB launch. You will receive an introduction to the RIB and how to use the waterproof safety suits. In high speed with sea spray in your face you will enjoy a trip through the Geirangerfjord accompanied by your expert guide. You will make photo stops at the famous waterfalls Seven Sisters, the Suitor and the Bridal Veil, and get very close to the falls. You will view the abandoned farms along the Geirangefjord such as Skageflå, Knivsflå, Blomberg, and Matvik, all of which reveal the life along the fjord many years back. Please note: This tour is not recommended for children under 14 and written consent must be provided by parent/guardian to participate. For safety reasons, this adventure is not recommended for people with limited mobility. Experience the tranquil beauty of Geirangerfjord from the water as you skim along its pristine surface by kayak. You will take a short bus ride to meet your guide who will give you a safety briefing and paddling instruction. Don your required life jacket and embark your double sea kayak to begin your adventure. You will pass several small homes along the coastline while you head toward the magnificent Seven Sisters Waterfall. Of its seven cascades, the tallest has a free fall of about 820 feet. Throughout, your guides will share stories and interesting facts about life in the fjord, the high mountains that form its walls and the incredible waterfalls. Please note: Participants must be at least 8 years of age and children must be accompanied by an adult. This tour is not recommended for pregnant women or guests with back or neck problems. All participants will be given a life jacket. Dress in warm, layered clothing and bring rain gear. Wear flat shoes, heels are not permitted. Although you will kayak toward Seven Sisters Waterfall the distance you cover will depend on the group you are traveling with. You may get wet! Enjoy a leisurely kayak through the fjords near Hellesylt. After a safety introduction, outfitting of the kayak and some paddle instructions you will be ready to set out in the fjord and explore. With your guide, you will follow the shoreline out from Hellesylt and have good opportunities to see eagles, porpoises, and otters. The guide will tell you stories about the mountain farms in the area and the mountain Åkerneset which is on it´s way to falling down in the fjord. Please note: No paddling experience needed, simply energy and enthusiasm! Participants must be at least 8 years of age and children must be accompanied by an adult. This tour is not recommended for pregnant women or guests with back or neck problems. All participants will be given a 2-person kayak, life jacket and spray skirt. Dress in warm, layered clothing and bring rain gear. Wear flat shoes. Wildlife sightings are not guaranteed. This is the perfect bicycle ride for people of all fitness levels. Choose your level of fitness and enjoy the peaceful scenery around you. From Hellesyt you will enjoy an easy ride on an e-bike along the river to Storøyna and the entrance of the pass over Flofjellet. You will cruise on your e-bikes on an old Norwegian road and pass by some villages and traditional farms. The landscape is rugged and scenic with waterfalls and steep mountains. Please note: Participants must be at least 12 yrs of age and accompanied by an adult. Dress in warm, layered clothing and bring rain gear in case of inclement weather. Alesund, the largest town on the Northwest coast, has a beautiful setting, built on several islands stretching out into the ocean. A large part of Alesund was destroyed by fire in 1904 and rebuilt in the Art Nouveau style. Today, it is a bustling town where the fish and fish processing industry are the main sources of income. You will take a stroll through the many rooms in the listed building known as "The Swan Pharmacy," and be mesmerized by the beautiful and authentic décor. The tour continues through the Jugend (Art Nouveau) quarters of the town center and inner harbor, through the attractive park at the foot of Mount Aksla and back to the pier and your ship. Please note: This tour is a walking tour with steps, cobblestones and uneven ground and is not recommended for people with mobility issues. Wear comfortable walking shoes. This is the perfect kayak experience for those interested in a more adventurous introduction of the Art Nouveau town of Ålesund. After a short 10-minute walk to the kayak center you will be outfitted with the proper equipment and given a brief safety talk before you board your 2-person sea kayak. This leisurely kayak trip will take you along Ålesund’s Jugend-style architecture where your guides will share stories about the area. You will be given an interpretation of the history and culture of this Art Nouveau city perched on the Atlantic. You will also paddle through the scenic maze of islands offering views of Ålesund’s coastline that you can only enjoy from the vantage point of a kayak. Please note: Participants must be at least 6 years of age and children must be accompanied by an adult. It is recommended that guests dress in layered clothing and wear flat shoes. You may get wet! Two- person (tandem) sea kayaks will be used. Not suitable for disabled people. Excursion is dependent on weather. After a short walk to the bicycle center your guide will give a brief safety instruction before you begin your adventurous and scenic ride to Hess Island. You will set off bicycling through Ålesund, riding past delightful stone buildings and churches carved with enchanting art nouveau décor. Riding over Asp Island and around the outer edge of Hess Island you will see beaches, pasturelands, and historic installations from World War ll. Arriving at Sugar Summit trailhead you will leave your bicycles and begin your 35-minute hike up to some breathtaking panoramic views of the sea, surrounding islands, Sunnmøre Alps and the city of Ålesund. The view is worth every step, making this the highlight of your tour. On your return bicycle ride you will get another chance to enjoy the scenic views that Ålesund has to offer. Please note: Participants must be 10 years of age and children must be accompanied by an adult. It is recommended that guests wear layered clothing and flat shoes. Take a bottle of water and backpack for your belongings. This scenic drive will take you all the way inland towards Valldal, where you will leave the fjords behind and make your way into the high mountains of the Romsdals Alps. You will make a stop at Gudbrandsjuvet, an 82-foot high ravine through which the Valldøla River has formed a complex of deep potholes and intricate formations. You will continue your drive into the high mountains of the Troll Road. At the 2,625-foot-high plateau, you will make a short stop to enjoy the magnificent view overlooking the valley. You will have an amazing view of the snowy peaks and the steep waterfall. Descending into the valley along the famous 11 hairpin turns you will follow the river towards Trollstigen Guesthouse where a delicious lunch is awaiting you. Surrounded by beautiful nature you will have enough time to enjoy your lunch before continuing your journey to the Troll Wall. The Troll Wall is the tallest vertical rock face in Europe, measuring over 3,281 feet from its base to the summit of its highest point. At its steepest, the summit ridge overhangs the base of the wall by nearly 164 feet. The ridge is and has been a prestigious goal for rock climbers and its summit was only first climbed in 1965. The Troll Wall is also considered a mecca for base jumpers , but has been made illegal, although some daredevils still attempt the jump after a 5-hour hike from the Trollstigen Plateau. After having admired the steep mountain ridge you will make your way back to Ålesund and the ship following a scenic drive along the Romsdalfjord and through the valleys and villages of the region. Please note: This tour is not wheelchair accessible and there are many stairs. Wear comfortable walking shoes. The community of Giske consists of four islands. Two of them will be visited on this tour - the Giske and Godøy Islands, which lie further to the west. The tour to the islands will take you via bridges and underwater tunnels, the longest being 2.6 miles (4.2 km). Giske is known as the Saga Island for the fact that the Viking Chieftain Rollo was born here. This island is fairly flat and fertile. On the island you will visit the old stone church dating back to 1150, originally a chapel belonging to the mighty Giske family. From Giske you will continue over to Godøy Island. On the northwestern side of the island you will drive towards the small but picturesque fishing village of Alnes, situated facing the Atlantic Ocean. Take a closer look at the old lighthouse, climb the stairs to the very top and enjoy refreshments at the visitor center. On the way back to the ship visit the viewpoint Mt. Aksla, with a spectacular view of Ålesund and the islands that have just been visited. Please note: Giske church is a working church and due to unforeseen church services, an inside visit to the church cannot be guaranteed. Wear comfortable walking shoes as the ground is uneven in places. Discover Ålesund’s stunning coastline during an exciting RIB adventure. A short walk from your ship you will find your captain waiting for you, where he will give you the necessary equipment and a brief safety talk. After boarding the RIB, your adventure beings as your captain takes you to the area’s most scenic spots. Once aboard, prepare to feel the adrenaline rush of the RIB boat’s speed and be awe-inspired by the scenery. You will venture to the island of Runde, with close-up views of Sunmøre’s beautiful coastline en route. Keep an eye out for the Grasøyane and Runde lighthouses, along with natural wonders such as interesting caves and abundant bird life. In fact, Runde is famous for its staggering number of birds, with between 500,000 and 700,000 of the winged creatures inhabiting the isle. Among the species you might spy are puffins, common guillemot, fulmar and razorbill. Please note: Participants must be at least 12 years of age, 4-1/2 feet tall, and children must be accompanied by an adult. This tour is not recommended for pregnant women or guests with back or neck problems. All participants will be given a weatherproof suit which is also a life jacket. Wear flat shoes, heels are not permitted. You may get wet! Your tour starts in the fishing port of Lerwick, founded in the 17th century. The center is full of character, especially by the water’s edge where the older buildings are situated. As we drive through the town we will see the Town Hall before turning west to the old town of Scalloway, the original main town and second largest settlement on the island. En route we will pass Clickimin Broch –a defense tower with surrounding structures dating back 2,000 years. On arrival in Scalloway we will stop to visit the now roofless Castle which was built around 1600 by the tyrant Earl Patrick Stewart. He used forced labor to build his residence and was executed in Edinburgh in 1615. You will then visit the fascinating local museum, which has a special display devoted to the Shetland Bus, boats which traveled between Shetland and Norway helping the Norwegian Resistance movement during World War II. If you prefer, wander along Scalloway’s Main Street and view the waterfront. Leaving Scalloway, you will travel through the Tingwall Valley, pausing for a photo stop to view a small herd of Shetland Ponies. Please note: Scalloway Museum is wheelchair accessible, Scalloway Castle is not. You will be driven through Lerwick, the largest town in Shetland, dating from the 1600s, as you travel to the northwest Shetland Mainland. Pass through Tingwall Valley and on to the picturesque community of Voe with its Scandinavian influence. The scenery becomes more and more spectacular as you head north through Brae, crossing Mavis Grind where the North Sea almost meets the Atlantic Ocean, passing the Drongs; a sea stack, where we have a photo stop, and on to Tangwick Haa (Hall). Here, visit the fascinating local museum and learn more about the area’s history of fishing and crofting before continuing to Eshaness Lighthouse. At Eshanes you can view the sea stacks and natural arches formed by the action of volcano and glacier – the black basalts and purple andesites that form the cliffs contain agates and amethysts. Some of Britain’s oldest rock, at nearly 3 billion years old, is not far away. A short walk along the cliff top allows you to savor and photograph the spectacular scenery. After your bracing walk, you will return to the lovely Braewick Café for refreshments with views of the spectacular seascapes, before heading south once more. On the return journey to Lerwick, look out for famous Shetland Ponies and hear more of Shetland’s culture and heritage from your experienced, local guide, having seen the very best scenery in Shetland. Please note: Wear comfortable walking shoes. There is limited wheelchair access on this tour. Depart through Lerwick, the capital of Shetland, as you begin your trip to the island’s most southerly point. En route, you will pass through the rural townships of Fladdabister and, conditions permitting, pause to admire the view of the magnificent Mousa Broch, the tallest and best preserved broch in the world. You will continue south down the west coast and pass St Ninian’s Isle where the famous Pictish horde of silver dating from the 9th Century was found in 1958. Continue south to visit the remarkable archaeological site of Jarlshof. The site was uncovered by a violent storm in the winter of 1896/7, revealing an extraordinary settlement site embracing at least 5,000 years of human history. The site contains a remarkable sequence of stone structures – late Neolithic houses, a Bronze-Age village, an Iron-Age broch and wheelhouses, several Norse longhouse, a medieval farmstead, and the 16th century laird’s house. Visit the remains of these village settlements with your guide to make the most of your time here. You will then return to Lerwick with your guide telling you more about these islands as we look out for Shetland’s famous ponies on the way back. Please note: Jarlshof is not wheelchair accessible. Wear comfortable walking shoes. You will leave Orkney’s biggest island and follow the coast of Scapa Flow to the smaller South Isles. Drive over the first of the Churchill Barriers, built during the Second World War to protect Scapa Flow. You will visit the beautiful, hand-painted Italian Chapel, built by Italian prisoners of war who were interned on this small island during World War II. The chapel stands as a lasting memorial to peace but also to the ingenuity and skill of the prisoners. You will continue your journey to Highland Park to discover Orkney’s highly acclaimed 12-year-old malt whisky at the world’s most northerly whisky distillery. Here there will be an opportunity to tour the distillery and try a wee dram! Returning to Kirkwall you will visit the beautiful 12th century sandstone St. Magnus Cathedral, built by the Vikings during their 700-year rule over the islands. Please note: Guests can stay on the motor coach if the tour becomes too strenuous. Depart Kirkwall and head into the west of Mainland, Orkney’s largest island. This tour passes through gentle rolling landscape and into the Neolithic Heartland of Orkney; an area designated as a UNESCO World Heritage Site due to its wealth of pre-historic archaeology. Passing the Standing Stones of Stenness you will stop at the Ring of Brodgar; a huge ceremonial circle of stones dating back almost 5,000 years. You then continue on to the 5000-year-old village of Skara Brae, beautifully interpreted in the visitor center. See the remarkable dwellings revealed from beneath the sand dunes by storms only 150 years ago. From here it is only a 656-foot walk to visit Skaill House, Orkney’s finest manor. Skaill was built by Bishop George Graham in 1620 on the site of a farmstead thought to date to the Norse period. In its 400 year history all 12 of its Lairds have been related and all have contributed to the history and collection in the house. Return to your coach and continue this circular route following the coastline of Scapa Flow, made famous for its role in both World Wars. Please note: The ground around the Ring of Brodgar is very soft and not suitable for wheelchairs or people with mobility issues. Wear comfortable walking shoes and warm clothing. Please note: This tour is not recommended for those with mobility issues as there are cobblestone walkways with steep inclines. This is a wonderful tour for exploring the South Isles of Orkney and sampling some local produce. You will leave Orkney’s biggest island and follow the coast of Scapa Flow on a 30-minute drive to the smaller South Isles. Drive over the first of the Churchill Barriers, built during the Second World War to protect Scapa Flow. You will visit the beautiful, hand-painted Italian Chapel, built by Italian prisoners of war who were interned on this small island during World War Two. The chapel stands as a lasting memorial to peace. You will then continue south across two further Churchill Barriers to the island of Burray and stop for delicious refreshments in the lovely small fishing town of Burray Village for a taster plate of some local produce including Bere Bannocks (local bread) and local farmhouse cheese, and Orkney Fudge Cheesecake. The tour will also include a glass of wine or beer. You will then continue to the Fossil and Heritage Centre. Here you will learn more about the heritage of Orkney and the building of the Churchill Barriers in addition to an opportunity to learn more about Orkney’s geological history before returning to the ship. Please note: Dress in warm, comfortable clothes and bring along waterproof things like an umbrella or rain poncho. This tour is wheelchair accessible. Your first stop will be in Kollafjørður where you will visit an old Faroese church with a traditional, Faroese turf roof. On our way farther north, we head toward the village of Saksun, tucked away at the end of the road. As you get closer to Saksun, surprising vistas will delight you around each twist in the road. Then, there it is – one of the most distinctive villages in the Faroes. The old farm, Dúvugarðar, is now a national heritage museum, and, together with the outbuildings that belong to the museum, it provides an intimate look into past rural life in the Faroes. The round bay below the farm was at one time a natural harbor. Today, although sand deposits have made its waters shallow and only accessible to small boats at high tide, it is the centerpiece of a spectacular panorama. You will return to Tórshavn via the mountain road and stop at the viewpoint overlooking the capital. Please note: There are 3-4 steps to enter the different venues and a small hill up to the museum in Saksun. This excursion departs by bus and will take you along the Kaldbak Fjord where you will enjoy the sight of cascading waterfalls and lazy sheep wandering about. Drive through the tunnel to Kollafjørður and further north through the valley and stop at the top of the columnar basalt of Streymoy Sill. Your walk will start from this point, situated 919 feet above sea level. Head up the mountain towards the sill. On the top you can admire the splendid scenery of the rock formation and a beautiful scenery of the island of Vágar. You will pause by the small lakes before heading back down the mountain. After the hike, return to Tórshavn via the mountain road and stop at the viewpoint overlooking the capital. Please note: Wear comfortable walking shoes and layered clothing. You will leave Streymoy Island via Kaldbakfjord and the Kollafjørdur Valley, then pass through the new underwater tunnel and, 5 minutes later, arrive on Vagar Island. You will appreciate Vagar's ever-changing scenery and will have time explore its villages. Your guide will tell you about the island, its history and about life here today. Drive through the village of Sandavágur, where you'll visit the Midvágur Church, and pass the largest lake in the Faroe Islands before reaching Vatnsoyrar. In Bøur, you'll discover a little village with both old and new houses with green sod roofs and a charming old tar-blackened church. From there take in the spectacular view of Tindholmur and Mykines Islands beyond. You'll leave Bour through the tunnel to Gasadalur-Vagar's westernmost village, then return to Tórshavn via the mountain road to capture the extraordinary panoramic views out over the fjords and the capital. Please note: There are small hills and steps on most of the stops. Wear comfortable walking shoes. From Tórshavn, take a 45-minute drive to the north, past idyllic villages and the old whaling station at Áir. The only bridge over the Atlantic, as it is sometimes called, spans the narrow channel of Sundini to connect Eysturoy with the larger island of Streymoy. Because the channel is so narrow, spectacular eddies form at the base of the bridge when the current is running strongly with the tide. You will pass Eiði and cross the mountains to Gjógv. On the way, you are treated to a view of the Giant and the Hag -two very distinctive sea stacks that your imagination will have fun with. You'll also pass the highest mountain in the Faroe Islands, Slættaratindur (2,983 feet) and see the rather handy Gjógv Gorge which, at 616-feet long, provides a marvelous natural harbor for the local fishing fleet to shelter in. Stop in the village of Gjógv, at the local guesthouse, to enjoy refreshments of coffee and tea with pancakes. The ride back to Tórshavn is via the mountain road and you will stop at the viewpoint overlooking the capital. Please note: This tour travels along a scenic mountain road. Ride by coach to the village of Vestmanna. Here, you will board a boat and head out to the famous bird cliffs. All your senses will awaken with the sound of sea birds, the salty scent of the sea and its cool spray on your face, the stunning, weather-beaten cliff formations and the raucous riot of squawking birds who call the sea cliffs home. You'll cruise along the cliff wall, into a narrow gorge where sheer rock walls rise vertically on both sides towards the sky. The boat slowly enters one of the many grottoes, and for a moment, daylight disappears. Darkness and the sound of dripping water surround you and then, suddenly, you emerge on the other side. The boat stops for a while so you can enjoy the scenery. Take photographs to help you remember the details. After the boat trip, return to Tórshavn via the mountain road and stop at the viewpoint looking over the capital. Please note: There are 4-5 steps to board the boat and the tour travels along a winding scenic mountain road. The Reykjanes Peninsula holds many geological wonders – one of the country’s deepest lakes, bubbling and steaming earth and the world-renowned Blue Lagoon. Your journey will start with a pleasant drive through Reykjavík city center with a short photo stop by one of the city’s main attractions, Hallgrímskirkja church. We will continue our tour by driving through the lively port town of Hafnarfjörður, situated picturesquely on an ancient lava flow. Continue on along the enchanting Kleifarvatn Lake, one of the deepest lakes in Iceland where you will have a photo opportunity and enjoy the rugged scenic landscape. Then on to Krýsuvík where in the geothermal field, powerful jets of steam escape from deep below the earth’s crust and the multicolored pools of boiling mud bubble and pop continuously. You will head on across the impressive volcanic plateau of Reykjanes, driving through the bustling fishing village of Grindavík before arriving at the Blue Lagoon, located in the middle of a beautiful lava field. The Lagoon’s aquamarine-colored water, the steam and the lava landscape surrounding it succeed in creating a unique and memorable atmosphere. You will have a unique bathing experience here. Homeward bound you will drive through the Reykjanes lava fields and through Reykjavik city before arriving at the Windstar hotel. Please note: This itinerary may operate in a different order if necessary. Wear comfortable walking shoes. This classic city tour takes in all the highlights of Reykjavík. Your journey will begin with a drive through Laugardalur (“Warm Water Valley”) where you will pass one of the most popular outdoor geothermal swimming pools. From there the road will lead you to drive past the open-air museum at Árbær. You will, then cross the Ellidaá River, one of the world’s cleanest salmon rivers. Eventually you will reach Álftanes Peninsula where the President’s residence, is located. Returning to the city you will drive to Perlan, The Pearl with its viewing deck that offers great panoramic views over Reykjavik. You will head towards Hallgrímskirkja, the church that dominates the city skyline with its imposing tower, then drive through the charming old quarter of Reykjavik with its colorful wooden houses and narrow streets , past the University of Iceland complex and along the city pond, Tjörnin. Then you’ll reach the old harbor where you’ll make a quick stop. Finally you will follow the coastline and make one short stop at Höfdi House where the summit meeting between President Ronald Reagan and Secretary General Mikhail Gorbachev was held in 1986. Drive directly to the Viking World Museum to enjoy the delicious Icelandic meat soup before exploring the museum. Then you will be drive to the airport or your waiting hotel. Please note: The order of the itinerary might be reversed if necessary. This tour aims at introducing you to the main attractions of the main Westman Island. You will board your coach and drive into the Herjolfsdalur Valley where old farmhouses can be found. Continue along the scenic western part of the island with a beautiful view of the outer islands of the archipelago. Your next stop will be the site of the largest colony of Atlantic puffins, then on to two volcanoes, the 5,000-year-old Helgafell and the considerably younger Eldfell, which erupted in 1973. You will make a stop here to walk to an amazing panoramic viewpoint. Continue on over the new lava field, past the Skansinn, a fort where a wooden church was donated by Norway, before returning back to the pier. Please note: Order of sites visited may vary. This exclusive tour contains the ultimate adventure, a combination of helicopter flightseeing and snowmobiling on Iceland’s 4th largest glacier, Mýrdalsjökull. You will depart from the main island of Vestmannaeyjar and fly over the islands of the archipelago before heading to the mainland. Among other wonders of Iceland’s nature you will see Eyjafjallajökull glacier, the volcano that erupted in 2010 and brought the world to a halt for a few days. You might catch a glimpse of Mountain Hekla, which is one of Iceland’s most active volcanoes with over 20 eruptions since the time of settlement in 874. Mýrdalsjökullwill be your destination,and after landing you will have a short lesson on safety procedures and how to operate the snowmobile. Next up is to push the throttle and ride the glacier while enjoying the magnificent scenery, with Eyjafjallajökull glacier from the west and the breathtaking view over the South coast and its black beach. The ride offers a fun, scenic and comfortable challenge you won’t forget. It is an ideal way to experience the wilderness and get in touch with nature. After the refreshing snowmobile ride you will board the helicopter and enjoy the scenery on the way back to Vestmannaeyjar. Please note: To operate the snowmobile a valid driver's license is required. Wear warm, layered clothing and good sturdy shoes. The Westman Islands are renowned for their birdlife and interesting geological history. You will walk to the RIB boat location where you will have a brief introduction to RIBs before your safari begins. You will travel into some of the caves around the area, such as the Eider Duck Cave, whose name derives from the eider duck colony nearby. You will visit a huge and extremely deep cave with beautiful basalt columns decorating the walls. You will also see a small cave where the sunlight shines through, creating a mesmerizing interplay of light and water. The final cave you will see is the roomy Cliff Cave with its excellent acoustics. Please note: While wildlife sightings are not guaranteed, whales are sometimes sighted on this tour, including orca, dolphins and porpoises. Often seals make an appearance as well as sea birds such as cormorants, fulmars, gannets and puffins. This trip is not recommended for people with back problems and pregnant women. This is a unique opportunity to see Iceland from the air. You will depart from the pier and drive to the airport to board your plane for a flightseeing tour. You will fly over Landeyjar with its fluorescent green moss and contrasting black sand, and see the popular Seljalandsfoss Waterfall. Approaching the highlands you will see Thorsmork, a glorious oasis sheltered by three glaciers. You will head back toward Heimaey and on the way you will see Skogarfoss Waterfall, where a single or double rainbow is usually visible on sunny days. Fly over the glaciers of Tindfjallajokull and Eyjafjallajokull before returning to the airport. Please note: Flights and flight routes are subject to weather conditions and may vary accordingly. You will board your coach and drive into the Herjolfsdalur Valley where old farmhouses can be found. Continue along the scenic western part of the island with a beautiful view of the outer islands of the archipelago. Your next stop will be the site of the largest colony of Atlantic puffins, then on to the 5,000-year-old Helgafell. You will make a stop here to walk to an amazing panoramic viewpoint. Continue on over the new lava field, past the Skansinn, a fort where a wooden church was donated by Norway. Then you will visit the new Eldheimar – “Pompeii of the North” Museum where the history and aftermath of the 1973 eruptions are explored. Head to the notorious Eldfell volcano before returning to your yacht. The beautiful Westman Islands are rich in natural beauty. Your walking tour with an informative guide will begin at the naturally formed harbor which was almost destroyed in the 1973 eruption. You will walk to Skansinn, an old fort built by orders of the Danish King in the 17th century. You will see the wooden church near the fort and walk up the hill to the newly formed lava fields of Eldfell. You will walk along the edge of the lava field with a great view over the town. You will see signs of old houses that were buried during the eruption as you walk to the crater of Eldfell where you will appreciate more of the power of nature. Please note: Wear comfortable walking shoes. We do not recommend this tour for guests with back problems. 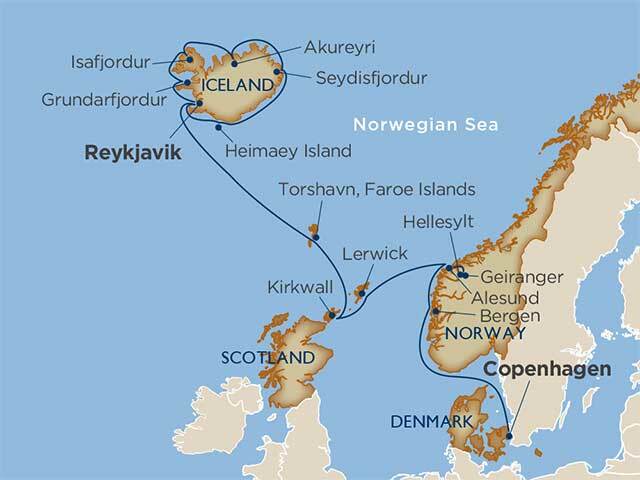 This tour will take you on a journey into the past, right by the edge of the largest wilderness area in Northern Europe. On a picturesque drive from Seyðisfjörður, head over the impressive mountain pass of Fjarðarheiði, which has numerous small and beautiful waterfalls. You will pass Egilsstaðir, a town of 2000 inhabitants and the commercial center of the area. Continue along Iceland’s third largest lake, Lagarfljót. The lake’s bed lies 328 feet below sea level, having been formed by glaciers over thousands of years. The lake is famous for the mythical “Ness” that is said to reside far below. There you will step off the coach and into the past in an adventurous fashion. At the Wilderness Center Exhibitions you will experience an adventure, be moved, surprised and enlightened without feeling as if you are in a museum. Every detail of the premises is designed to simulate the atmosphere of the life in the early days. Before you make your way back to the pier you will enjoy traditional, homemade refreshments. On the way back to the pier you’ll pass the beautiful Hallormsstaðarskógur forest where over 40 species of trees from various parts of the world grow. Please note: Dress warmly in layered clothing to face the unpredictabillity of Icelandic weather. The nature surrounding the town of Seydisfjordur is a spellbinding display of waterfalls, mountains, and the ocean. This hiking tour will provide you with the excellent opportunity to explore the beauty of the Icelandic landscape. This guided walk will take you on a hike up to a part of the Vestdalur Valley near Seydisfjordur. The valley is a protected nature reserve due to its remarkable flora. Eventually you will reach the abandoned town of Vestdalseyri, where you will find ruins of the former town. The town was inhabited for roughly a century (1851-1963). Originally there was a whaling station and it was home to one of the largest cooperatives in the country. Despite its beautiful and sunny location the town declined with the last inhabitant leaving it in 1963. You will walk past a series of beautiful waterfalls that will provide ideal photo opportunities, then return back to the coach and return to the pier. Please note: Dress warmly in layered clothing due to the unpredictability of Icelandic weather. Wear comfortable sturdy shoes. This hiking tour will take you on a walk to the third highest waterfall in Iceland. You will depart from the pier and drive over the impressive mountain pass of Fjardarheidi, passing several small waterfalls. You will stop at the village of Egilsstadir, then drive along Iceland’s third largest lake, Lagarfljot, with a lake bed that lies 328 feet below sea level. You will arrive at the starting point of your hike and it will take about 1.5 hours to reach the waterfall, with a drop of 387 feet. Your descent from the waterfall will take about an hour and then you will drive around Lake Lagarfljot to reach one of the few forests in Iceland, Hallormsstadur, where over 40 species of trees from various parts of the world grow. Please note: Wear comfortable clothes and hiking shoes. This will be an easy and pleasant trail walk from the center of Seyðisfjörður, going partly on a gravel and grassy walkway through a forestry area and in to Fjarðarsel where you will find many beautiful waterfalls and a variety of Icelandic vegetation. Wild crowberries and blueberries can be found there in late august. The scenic mountains, waterfalls, vegetation and the history of the town is a wonderful blend that makes this walk unforgettable. Please note: Guests are advised to use marked footpaths to protect sensitive nature and to leave nothing but footprints and take nothing but photos and memories. Wear comfortable walking shoes and layered clothing. Here is a unique opportunity to visit one of Iceland’s most remote places. You will drive to Thorarinsstadir, an important archaeological farm site. Then you will continue on to Skalanes Nature Reserve, where you will have a guided tour of the site where the Icelandic environment and cultural history can be researched and interpreted while maintaining a model for sustainable tourism. The area is home to about 47 different species of birds during the summer and sometimes seals or reindeer can be spotted and on rare occasions a whale can be seen off the coast. Eider ducks nest in great numbers around the pond here.Before heading back to your waiting yacht you will enjoy some local refreshments. You will board a coach and drive over the impressive mountain pass of Fjardarheidi to Egilsstadir, the commercial center of east Iceland. From there you will continue along Lagarfljot, Iceland’s third largest lake that is 328 feet below sea level. You will arrive at Skriduklaustur, the former home of one of Iceland’s greatest writers, Gunnar Gunnarsson. You will walk from there to Snaefellsstofa, the visitor’s center for the area. Continue on to Valthjofsstadur, a 13th century church estate containing many valuable items. Back on your coach you will pass Hallormsstadur, one of the country’s most successful forestry stations with over 40 species of trees from various parts of the world. You will make one last stop in Egilsstadir to visit a souvenir shop with handcrafted items made by local artists. Please note: Sites might be visited in a different order. Wear comfortable walking shoes. Visit Mjóifjörður (‘Narrow Fjord’) and its attractions during this half-day tour in a specialized 4x4 vehicle with a local driver-guide. Mjóifjörður Fjord is known for its tranquility and history. During this tour you will visit some of its highlights and acquaint yourself with its history. You will stop by the waterfall of Klifabrekkufossar, where clear water tumbles down a tiered hillside by the road. Continuing on you will make a stop in the tiny village of Brekka, which has less than 40 inhabitants. You will also see the remains of a Norwegian whaling station at Asknes, it was the largest of its kind when it was built by the Norwegians around 1900, providing employment to approximately 200 workers. As you drive to the edge of the fjord you will see the solitary lighthouse at Dalatangi. The first lighthouse in Iceland was built at Dalatangi in 1895 and the old building can still be seen there to this day. You will then drive back to the pier and enjoy the beautiful and imposing scenery that this small but impressive fjord offers. Please note: Tour time is approximate since the driving times depend on road conditions and weather. Mind-blowing scenery, bubbling hot springs, action and relaxation combine to deliver a splash of unforgettable memories on a river rafting adventure tour through the magnificent West Glacial River Canyon. The journey will start with a scenic drive to the base camp in Skagafjörður where you will gear up and have safety instructions before heading down to the river to enjoy a 1.5 hour rafting through the canyon. On the way you’ll have the opportunity to sample hot cocoa from nature’s own kettle and the brave ones might want to try a little cliff jumping. This tour is ideal for those who want to enjoy a gentle water experience and the opportunity to explore Icelandic wilderness from the depths of the canyon with its high walls and extraordinary geology. After the rafting you can have a relaxing moment in the outdoor hot tubs before enjoying the famous and delicious Icelandic meat soup. The Diamond Circle Air Tour will take you on a classic sightseeing scenic flight over Godafoss Waterfall, Lake Myvatn and Dettifoss Waterfall, Europe’s most powerful waterfall. Fly through the landscape of the epic television series The Game of Thrones, filmed in this dramatic landscape. The route will explore Godafoss Waterfall and then over Lake Myvatn, with its numerous scenic attractions and geothermal phenomena. From Lake Myvatn fly over Vatnajökull National Park to see Dettifoss, a spectacular waterfall where cascades plunge from a height of 144 feet into a narrow canyon. From the Dettifoss Waterfall you will follow the magnificent canyons, before turning homeward bound for Akureyri. Relax and take in the north-east coastline as the Troll Peninsula mountain range comes into view in the west. Please note: Wear weather-appropriate clothing. There is an old Icelandic law that forbids the import of horses and any horse that leaves Iceland is barred from returning. Icelandic horses have been nicknamed, “the most useful servants” and they were bred to withstand the harsh elements. You will depart from the pier and drive the short distance to the stables where you will be saddled up with a gentle horse and head out for a 1-hour easy riding tour through the lush countryside near Akureyri. Please note: The age limit for this tour is 12. No prior riding experience is required and all necessary equipment will be provided. Wear comfortable clothing. This popular tour encompasses the highlights of Northern Iceland. You will begin with a drive along the picturesque coastline of Eyjafjordur Fjord to beautiful Godafoss Waterfall. You will continue through fertile farmlands to reach Lake Myvatn, one of Iceland’s natural treasures. This lake is home to thousands of birds. Your next stop will be Namaskard, a striking geothermal field full of mud-pots, steam vents, sulfur deposits, boiling springs and fumaroles. Close by is Dimmuborgir, a dramatic lava landscape with strange formations, columns and arches that have been the source of many icelandic folktales. A short drive away you will find Skutustadir pseudo-craters, formed by gas explosions when boiling lava flowed over the wetlands near the lake. You will have lunch at a local restaurant before returning to your waiting ship. Please note: The order of sites visited may vary. Take a leisurely journey around Akureyri and its nearby surroundings. You will depart from the pier and head along the coastline through lush and fertile farmlands to reach Godafoss, known as the ”Waterfall of the Gods.” Then you will return to Akureyri, colorfully framed by the sea and the mountains. Take a short sightseeing tour of Akureyri’s old quarter with architecture that bears a strong Danish influence, before driving to the Akureyri Botanical Gardens, founded in 1912, and presenting examples of every species indigenous to Iceland as well as an extensive collection of high-altitude, high-latitude plants from around the world. After our visit to the Botanical Garden we’ll drive a short distance to the famous Art Alley where we will set out on foot and walk back to the pier. On this short walk we will stroll through the Art Alley, passing the Akureyri Church, before reaching the pier. Please note: The order of sites seen may be reversed. There is hardly a better way to enjoy Iceland’s plentiful geothermal power and beautiful vistas of lava and moss than a visit to one of the best nature baths. You will depart from the pier for the 1.5-hour drive to Myvatn Nature Baths. The tastefully designed complex will offer you a relaxing dip in clouds of steam rising from below the earth’s surface. These warm and soothing waters benefit both your skin and your spirit. You will have 1.5 hours to enjoy the baths before your 1-hour drive to Godafoss Waterfall where you will have time to take photos and appreciate the beauty of the falls. Re-board your motor coach for the 40-minute drive back to your waiting ship. Please note: Bring your camera, swim suit, and wear comfortable walking shoes. Order of sites visited may be reversed. You will travel along the Eyjafjörður coastline to Siglufjörður Fjord, focusing on coastal life and the beautiful seaside surroundings on the way. You will have time to walk on a black-sand beach in Ólafsfjörður Village. From there you will travel to Siglufjörður Village, the shooting location for the popular Icelandic TV series “Trapped.” Among other stops will be the busy harbor area of Dalvík Village, one of the biggest ports in the Icelandic fishing industry, and the old herring factory in Hjalteyri Village. The tour will end with a special visit to Kaldi Brewery, Iceland’s first microbrewery, where you will get to taste their products, along with local food, matched with their brews. Please note: Wear warm layered clothes and comfortable walking shoes. Experience getting up close to the incredible humpback whales of the Eyjafjörður Fjord, a place of serene beauty and marine life, framed by glacier-carved and snow-capped mountains. The Eyjafjörður Fjord is narrow and deep and is perfect for the small RIB boats that depart from Akureyri pier. With only 12 guests per boat the RIB boats will allow you to get closer to the whales and wildlife than any other boat can offer. The boats are small and fast which means youcan cover a larger area as you search for wildlife. This allows for an increased chance of spotting whales, dolphins and bird life. Like all wild nature experiences, sightings cannot be guaranteed. However, the potential for whale watching from Akureyri is excellent and has a 95% success rate for spotting whales. Many species have been sighted here, including blue-fin, humpback, minke and sei whales. Please note: This tour is not for those with back or neck problems. Safety overalls will be offered onboard the boats. It is recommended you bring your own warm and waterproof clothes, as it can be cold and wet and wear flat comfortable shoes. On this tour you will learn about Iceland’s only native terrestrial mammal, the Arctic fox during a visit to the charming village of Sudavik. You will board a coach for the 25-minute scenic drive to Sudavik village. The village is divided into two halves – the old town and the new town. The old town was hit by an avalanche in 1995. In the middle is the Arctic Fox Centre, a non-profit research center and museum dedicated to the fox that you will visit. You will have time to have a coffee break at their lovely café. Next you will visit the local church to hear a traditional Icelandic music program. Continue your drive to Langeyri Peninsula where you will see the remains of two whaling stations. On your way back to Isafjordur you will stop along the Alftafjordur fjord and then another short stop to visit the avalanche memorial sign. Please note: Sites may be visited in a different order. In 2 hours on an ATV you will be able to see all the surroundings of Isafjordur in a great and fun way. This tour will start in downtown Isafjordur. Your guide will make sure you know the bike before the tour begins. You will drive through the town up towards the mountain, where you will take a gravel road into the fjord. From there you will drive down to the beach and again up another mountain road up to the top of the mountain Þverfjall. From there you will have an amazing view over Skutulsfjordur and to the next fjords. On the way back you will drive through the forest in Tungudalur. What a great way to experience Isafjordur and its surroundings from a different perspective. Please note: Photostops can be made wherever you want. There will be 1-2 people on each bike.The bikes are automatic and easy to drive. All you need is a driver’s license. Included are a helmet, gloves and an insulatetd coverall. Vigur is a lovely island and the nesting ground for countless birds and the home of farmers whose family has lived there since 1884. You will board a boat for the 30-minute trip to Vigur where you will take a leisurely walk around the island with a perfect opportunity to see birds like Eider ducks in their natural environment. The farmer protects the nests and uses the down that the ducks pluck from their chests. You will see Iceland’s oldest windmill, built in 1840 and a 200-year-old rowboat still used to ferry sheep to the mainland. You will visit the Viktoria House, restored by the National Museum of Iceland where you will be served coffee and cakes and see one of the smallest post offices in Europe. Please note: The sighting of sea birds cannot be guaranteed as it depends on the season and the weather. Wear comfortable walking shoes. Fjord kayaking is not only a healthy and rewarding way to spend some time, it’s also a perfect way to get to know Icelandic nature up close. The West Fjords have earned a deserved reputation for being the nature- and adventure-lover’s paradise. You will take a short walk to the kayak center and receive some instruction on kayaking before beginning your tour. You will see the fjord’s beauty right from the water under the magnificent mountains towering over the area in this get-close-to-nature experience. Please note: Wear comfortable shoes and clothing. Explore the highlights of the Bolungarvik region on an Icelandic super jeep. Your first stop will be the famous Osvor Maritime Museum, where you will stop for about half an hour to learn about this 19th century fishing base. Afterwards you will take the steep and impressive road to the Bolafjall mountain peak, which on a clear day offers panoramic views over northern Isafjardardjup Bay and Hornstrandir. There is an old radar station at the top of Bolafjall, which was built by the US Army but is no longer in use. Finally you will traverse to the remote creek of Skalavik, which used to be inhabited decades ago but now features only summerhouses. Stop by the beach and take a short walk there to admire the beautiful surf coming straight in from the Arctic Ocean. Please note: The museum admission is included in this shore excursion price. Because of the jeep’s large tires, this tour is not suitable to persons with severe mobility restrictions, who are very overweight, and/or not very tall. Wear warm layered clothing. You will begin this tour with a 90-minute drive to Dynjandi, the majestic icon of the Westfjords. There you will stop for up to an hour to enjoy the wonderful views of the waterfall and Arnarfjordur fjord, and listen to the soothing sound of Dynjandi tumbling down the mountain in a series of seven waterfalls. The top tier is certainly the most impressive but each one of the other 6 is unique in its own right! You will have the option to doing the easy hike up to the top tier for a magnificent view (you can decide how far up you are comfortable going, and people of average fitness with no leg problems can comfortably go to the top). On your way back you will stop for half an hour at Hrafnseyri, a perfect place to enjoy light refreshments and take an optional stroll around to explore the traditional turfhouses and church, or to enter the museum dedicated to Iceland's independence hero Jón Sigurðsson who was born in Hrafnseyri. Please note: No hiking equipment is provided nor necessary, but guests are encouraged to wear hiking boots or comparable outdoor shoes and to dress warmly for the optional walk up to the top tier of Dynjandi. This is a combo tour of the Osvor Maritime Museum and Hesteyri abandoned village. Osvor is a replica of a 19th century fishing station that has been converted into a museum. The museum contains a double 19th century fishing base, a salt hut, a fish drying area and a drying hut. Among the pieces displayed, there is the rowboat Ölver that gives a good idea of the kind of ships that were used for fishing in that time. In the museum are also for display all kinds of fishing equipment and various tools that were used for fishing and fish production in the time of the fishing base. The curator will greet you wearing a skin suit that is similar to the one Icelandic sailors wore in that time and will describe what you will see there. The boat tour will go to the beaches of Hornstrandir, one of the most beautiful and remote areas in Iceland. The abandoned village of Hesteyri can only be reached by boat and is a wonderful spot where time has stood still for several decades. On your boat ride you will see spectacular sceneries of the fjord and perhaps catch a glimpse of Drangajökull Glacier and maybe some puffins and arctic terns. On rare occasions whales are seen in the fjords and seals sometime swim alongside the boat. After a 50-60 minute ride you will arrive at Hesteyri Village. The area is now a nature reserve, where the arctic fox feels very much at home and you are likely to see some scurrying off. Until the 1950s Hesteyri had a small and scattered community supported by the whaling industry and a herring processing plant. Eventually the isolation and hardships that the location imposed proved too hard to bear. The villagers made the joint decision to abandon their homes and seek a new life elsewhere. A dozen houses are still maintained as summer residences for the former villagers and their descendants. Your guide will take you on an informative walk around this fascinating place. You’ll have some refreshments in the former doctor’s residence before heading back to Isafjordur. Please note: Wear warm layered clothing as it can get breezy on the boat and good sturdy shoes for the uneven steps. This tour is not for people with mobility concerns as you might need to take a small Zodiac to go ashore for the stop in Hesteyri if it is low tide. Please note: Wear comfortable walking shoes and warm layered clothing. For those of you who want to know what current life is like, this walking tour will provide an insight into the modern life of the local people in Ísafjörður. Following a stroll around the heart of the town, you will drop in at the Culture House for an insight into the local arts. A taste of the modern local cuisine awaits you at a popular pub, where the locals gather to party away the long winter nights. Dropping in at the Everyday Museum, take a peek into the life of local people through a variety of media. The tour will round off perfectly, with the last stop at the town´s recently established brewery. Enjoy the breathtaking view over the unique landscape from the sea side while looking out for whales and maybe even seals and birds in their beautiful natural environment. You will cruise around Ísafjarðardjúp, the stunning fjord region by Ísafjörður town with it‘s beautiful fjords and mountain ranges. Your journey will bring you past the beautiful bird island Vigur or Snæfjallaströnd (Snow-Mountain Coast). Chances are high that you’ll spot different kinds of birds such as puffins flying around, seals might swim by and probably even whales swimming across the sailing route. With only 12 guests per boat the RIB boats will allow you to get closer to the whales and wildlife than any other boat can offer. The boats are small and fast which means you can cover a larger area as you search for wildlife. Please note: Wear warm layered clothes and good sturdy walking shoes. Like all wild nature experiences, sightings cannot be guaranteed. We do not recommend this tour for guests with back problems or pregnant women. Wild and rugged, uncompromising and mesmerizingly beautiful, geologically and volcanically active, a place of thermal springs, mountains, valleys, rivers and waterfalls: the incredible island of Iceland is all of these things. In addition, – as everybody surely knows – the island’s craggy mountainsides provide a comfortable home for the world’s remaining trolls, those formidable creatures of Norse mythology. According to a legend told by the locals of Ísafjörður, a huge troll once lived in the area and one day, he decided to go for a walk in the fjord. However, soon getting tired from all the exercise, the troll spotted a nice tall mountain high above the town that looked like the perfect spot to have a rest. However, when the thickset troll sat down, his incredible weight squashed part of the mountainside, leaving a large indentation that remains visible to this day: the so-called Troll’s Throne, or Naustahvilft, Its proper name. Situated only a few hundred feet up the mountain from the port, the Troll’s Throne is a popular hiking destination for tourists and locals alike. Your walking experience up to the bowl-like “throne,” which was actually formed by a glacier, will take you over ideal hiking terrain: a good mixture of grass, soil and sheep-trodden paths. Once at the top, you will be rewarded with wonderful views over the port and the picturesque fjord. Your return hike back down the mountain to your ship marks the end of this troll-themed tour. Please note: Wear sturdy walking shoes and warm clothing. Make your own journey to the center of the earth during this exciting tour that is perfect for the adventurous visitor. The tour will begin with a scenic drive from the port in Grundarfjörður.As we get closer to Snæfellsjökull Glacier you will reach your destination where your guide will greet you.After all the guests have been provided with helmets and flashlights you will head to the entrance of the cave. Inside the lava cave there are two main sections. The upper section has great features and unique formations of lava.The lower part of the lava cave can only be reached by a long and narrow staircase that will take you deep underground, to a place which was hidden from the outside world for thousands of years. As you make your way through the cave the guide will inform you about the geology, history and folklore associated with the cave. When you’re deep inside the lower cave all the lights will be turned off and you will experience total darkness. Snæfellsjökull Glacier is one of the most picturesque mountains in Iceland. Rising up to 4,800 feet over sea level in the middle of the Snæfellsnes Peninsula this famous volcano is visible from more than 62 miles away. The most widely known literature about the glacier is Jules Verne’s novel, Journey to the Center of the Earth. According to Verne the entrance to get down to the center lies through a caldera at the top of the glacier. Your drive to the glacier will offer a breathtaking view. On clear days the whole Westfjord peninsula is visible and beyond the North Atlantic Ocean, the shores of Greenland can be made out. This is one of the very best glacier hikes in the world. You will experience walking on ice through beautiful scenery from the roots of the glacier up to the crevasse area where you can see beautiful ice formations. After the hike you will drive down to a local restaurant in the tiny fishing village of Arnarstapi. There you will enjoy a delicious soup and enjoy the surroundings after your refreshing glacier hike. Please note: This tour involves walking on a glacier, which is uneven and slippery in parts. Helmets are provided and must be worn. Crampons and an ice ax will also be provided for use on the glacier. Be ready for all kinds of weather. Dress in layers. Wind and rain protected clothes. Sturdy hiking shoes must be worn and bring gloves. This tour is not recommended for guests with limited mobility and participants must be at least 12 years of age. This wildlife and sea-angling tour takes you to the bountiful waters of Breidafjordur Bay. You will board your boat and head for the nearby island of Melrakkaey, a nature reserve where many birds are free to nest, such as puffins, shags, cormorants, kittiwakes, and more. You will sail close to the cliffs to get the best view and photograph these beautiful ocean birds. Then you will try some sea-angling. It will be action and excitement as you try to catch the big one. Please note: Bring your camera. Sightings of particular birds cannot be guaranteed. This tour offers a hiking experience in the extensive Berserkjahraun Lava Field in the mystical Snæfellsnes Peninsula. Berserkjahraun, which roughly translates to “mad-man lava field” is a place where green moss partly covers ancient black lava rocks surrounded by pyramid-shaped mountains and the sea. The sources of the lava are four prominent scoria craters which erupted at short intervals approximately 4,000 years ago. The lava field is also central to the story of two men which appears in Eyrbyggja Saga. One of them fell in love with the chieftain’s daughter and was promised her hand in marriage on the condition that he build a path through the rugged lava field. The men went “berserk” and completed the task in a remarkably short time. When they finished the chieftain arranged for their murder and had them buried close to the bridle path. Excavations have revealed that, like many of the Icelandic Sagas, the story might have some elements of truth to it. You will hike for about an hour over this interesting terrain. Please note: Be ready for all kinds of weather. Dress in layers. Have wind and rain protected clothes and good sturdy hiking boots. Snæfellsjökull Glacier has been immortalized in the fictional works of Jules Verne and Halldór Laxness. This tour gives visitors the perfect opportunity to visit this mystical ice cap which towers over the Snæfellsnes peninsula. The fantastic glacier tour to Snæfellsjökull will begin as you board the transfer coach which will bring you to the glacial roots. There you will change vehicles and board a specialized glacier vehicle and drive up to the glacier to about 4,600 feet above sea level. There you will stop and enjoy the sights of the glacier. If weather allows, you’ll have a beautiful panoramic view over Hellissandur Sand, the wide bay of Breiðafjörður and as far as Látrabjarg Cliffs. After you’ve enjoyed the stop you’ll drive back down the glacier to Arnarastapi where you will enjoy hot chocolate and pancakes with cream and jam before driving back to the pier. This incredible boat tour sails around the unspoiled islands off the shore of the scenic Snaefellsnes Peninsula. You will drive from the pier along the otherworldly landscape to the town of Stykkisholmur where you will board a ferry for your archipelago adventure. You will sail through whirlpool currents past numerous islands with strange but beautiful rock formations and basalt columns. This tour will be a treat for bird watchers as birds nest and breed in the rocks and cliffs and when seen will provide amazing photo opportunities. Among the birds nesting here are puffins, shags, cormorants, kittiwakes, black guillemots, fulmars and other bird species. You may also spot a seal gliding around the boat. The captain will demonstrate how rich in marine life the waters are here as he will haul in a net filled with fresh delicacies. You will have the opportunity to sample the catch right on the boat. You will return to Stykkisholmur where you will have half an hour at your leisure before returning to Grundarfjordur. Please note: Sightings of specific birds cannot be guaranteed. This tour will offer a chance to see many of the wonderful highlights of Snaefellsnes Peninsula. You will drive through several small fishing villages that hug the dramatic coast on your way to the famous Snaefellsjokull Glacier. You will stop at Djupalonssandur Beach for a short refreshing walk on the pebbled beach where strange rock formations are found and you can take the strength test on four great rocks weighing from 50 to 340 pounds. After a short drive past the cliffs of Londrangar, you will arrive in the tiny fishing village of Arnarstapi with its many interesting lava formations and an abundance of birdlife. After a walk you will board your coach and head for Budir, famed for its beautiful surroundings of black lava and yellow-sand beach. You will visit the church then continue over Frodarheidi Heath back to Grundarfjordur. Please note: Sightings of sea birds cannot be guaranteed. Wear comfortable walking shoes. The itinerary order may vary.